It turns out that this Maverick wasn't the only one on the island, though today's car is nearly identical to the last one. Yes, another gold '74 two-door Maverick! What are the odds? I discovered this car just around the corner from the Killer Whale Transporter, which reminds me that air-cooled VWs seem to have a better survival rate than Mavericks. Come to think of it, the Pinto may be the only high-production Malaise Ford that's disappeared more completely than the Maverick; I haven't seen a Pinto on the street for years. 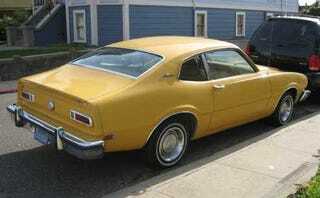 The Maverick really wasn't a bad car, although the Fairlane-esque leaf-spring suspension and was getting a bit long of tooth by the mid-70s. This one is in very nice original condition, down to the factory hubcaps and California emissions sticker on the side window.